Havana filmmaker Miguel Coyula uses low-budget special effects to create amid Cuba's artistic oppression. Interrupt This Program returns for Season 3 October 13th, at 8:30pm. Catch up on Season 1 and 2 now! "In Cuba, if you're an artist and your work is politically subversive, you don't exist." Those are the words of Miguel Coyula. His 2010 film Memories of Overdevelopment premiered at Sundance and went to festivals around the world, but in his home country he struggles to get his films made and seen, facing a lack of resources and a government hostile to artistic criticism. To make his films in this environment where the authorities do not approve, Coyula has to be resourceful — resulting in guerilla-shot films filled with collage-style special effects. "Getting a film permit for me is a big problem," he says. "I just try to arrive [at] a place and shoot as quickly as possible, and then use post production to add all the elements I can't control." In a country where Coyula says "the biggest challenge is how to put food on your plate," access to the technology he needs to make films is a challenge. 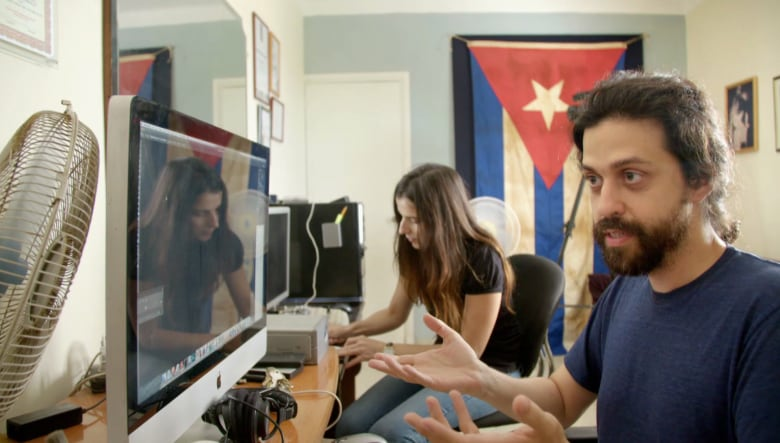 "Everything in Cuba is pirated — movies, music, software. We go to visit a friend and we bring a hard drive with whatever we have, and we take whatever he has. That's really the internet of Cuba." Coyula fears having his equipment taken away, but also a great deal more than that as he keeps making art which acknowledges the "shadow" of Fidel Castro "looming over everything" — which he says is "something that should be addressed in film directly." For Coyula the risk is worth it, and making his films is something he feels compelled to do. "If you stay here you have to be willing to sacrifice having a normal life and just dedicate yourself to it. It doesn't matter if you get recognition or not. You just have to do it. It's something you have to get out of your system." See more of Miguel Coyula's story in Interrupt This Program: Havana and catch up on Season 1 and 2 before Season 3 premieres October 13th with episodes in Mexico City, Nairobi, Jakarta, Chicago, Karachi and Warsaw.